On the hunt for some gorgeous green beauty gifts? These luxury organic treats from The Rose Tree are almost too good to share! 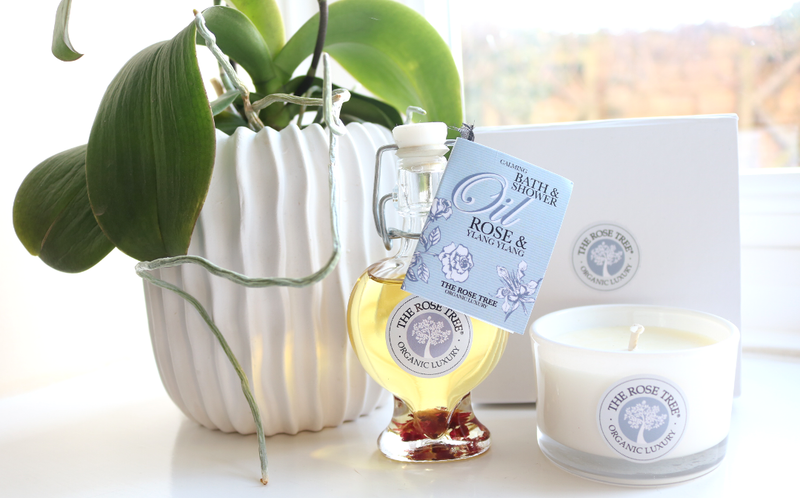 The Rose Tree are a new natural brand that I've been introduced to recently by the founder Olga, whose enthusiasm for organic beauty started at a young age when she was gifted a book about herbs and plants by her father for Christmas. 30 years later, burnt out from a stressful corporate job, she found herself searching for plant-based remedies to calm her stress levels and eczema and thus, The Rose Tree was ultimately born. I always admire anyone who has the guts to give up the day job and follow their passions, so I was intrigued to see what The Rose Tree has to offer. The whole range is based on organic luxury products that make you feel relaxed, amazing, and happy which is something that I can certainly get on board with! There are cleansing butters, facial essences, bath and shower oils, body oils and candles to name a few, alongside some beautiful gift sets which are perfect for introducing loved ones to the world of organic beauty - or ideal as try me kits for yourself! I was very kindly sent two products by Olga to review which I've been enjoying for the past month, and both of these would make wonderful gifts. For pure relaxing indulgence, you can't beat a long hot soak with a beautifully scented Bath & Shower Oil, and this particular oil is simply divine. 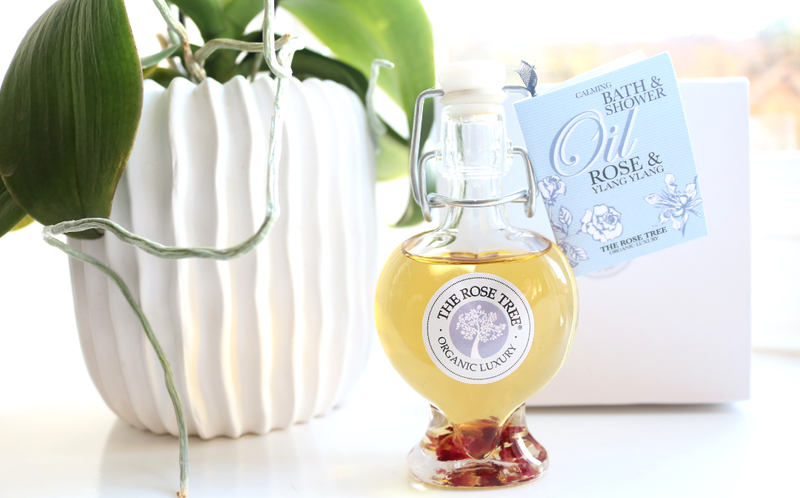 Packaged in a delightful heart-shaped glass bottle, these Bath & Shower Oils are available in several different scent combinations, but naturally, when I saw a Rose and Ylang Ylang one, I knew I had to try it! Both of these essential oils are two of my favourite scents and they work so well together for a luxurious pampering experience. Made with 78% organic ingredients (Apricot Oil, Rose Damascena Oil, Calendula Flower Extract, Ylang Ylang Flower Oil, Patchouli, Rose Geranium Flower Oil and Safflower Oil), there's enough product in this bottle for up to 16 baths/showers. Whilst it can be used in the shower (just smooth a small amount over your body before going in), I personally prefer to use a few drops in the bath to fully reap all of the relaxing benefits. It smells incredible and leaves my skin feeling soft afterwards. To complete your at-home pampering session, simply light one of these Luxury Natural Wax Candles and enjoy an instant moment of calm and happiness. Hand-poured in the UK, they're made from 100% pure vegetable wax and are scented with a higher level of pure plant and flower essential oils, making them naturally free from paraffin, artificial chemicals and synthetic parfum. Like the Bath & Shower Oils, the Candles also come in a variety of enticing blends and Olga chose No.5 for me, which is inspired by British springtime and summed up as 'blossoms bursting into flowers coupled with zesty fruits'. It's a fresh, relaxing and uplifting scent with Orange, Lemon, Lime, Lavender and Rosemary all featured together in this unique blend. This travel size version will happily burn for up to 19 hours, is presented in a lovely gift box and has an impressive scent throw. I don't think I've ever found a more perfect candle for Spring! I just ordered this bath oil on Love Lula and I cannot wait to use it! 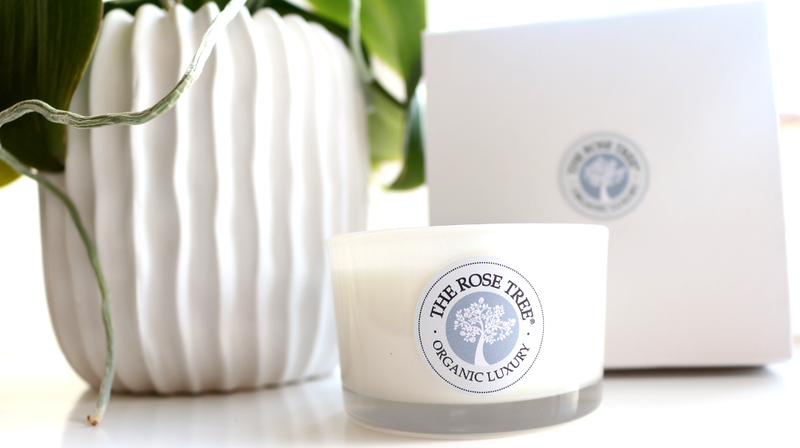 I didn't realize The Rose Tree also made candles - I'll have to take a look at those as I'm always looking for new eco friendly candles :) does it burn pretty evenly?